Via Jaume I, 76, 07180 Santa Ponça, Spanje. Perfect hotel to spend the holidays in Santa Ponsa. The Playas del Rey Hotel is located in the Majorcan summer resort Santa Ponsa, very close to one of the best sandy beaches of the island. All the rooms are with views toward the sea and the beach. The hotel also offers a bar-restaurant where you can taste any kind of cocktails, or enjoy special breakfasts, lunches or dinners, as well. Moreover, the hotel is surrounded of Mediterranean gardens, with one big swimming pool with terrace. Enjoy the beach and the beauty of the hotel neighbourhood, where you can also practice golf, tennis, bike riding, hiking or kayak. 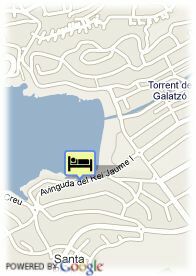 The Complex includes the Hotel Pionero ***, Hotel Santa Ponsa Park ***, and Hotel Playa Santa Ponsa **.